1. Not to be confused under any circumstances with Santa Claus, the 1959 Rene Cardona film. Santa was based on a popular novel about a woman, betrayed by her lover and ostracized by her family, who becomes a prostitute; the story had previously been filmed in 1918, and would be remade several times in the sound era.
. Wikipedia dates the beginning of the era to 1933, without much supporting evidence. 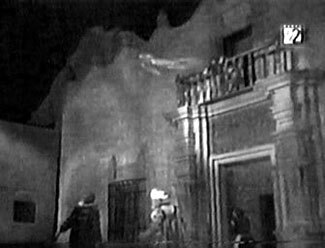 CineMexicano states unequivocally that Fernando de Fuentes' Allá en el Rancho Grande (1936) should be considered the film that inaugurated the Golden Age, because of its cultural importance, its popularity and its commercial viability on the international market... which sounds solid, especially considering that de Feuntes's next film, ¡Vámonos con Pancho Villa! , was cited in SOMOS magazine's 1994 survey as the greatest Mexican film ever made. However, this view overlooks a handful of other important films, including de Fuentes's El Compadre Mendoza (1933), which comes in at number three on SOMOS's list. Arguments can also be made that push the date as late as 1939, when the impact of the Second World War on the production of films in Europe and the US increased the demand for Mexican movies both domestically and internationally... or even 1940, with the great comedian Cantinflas emerging as a mature performer in Allí Está el Detalle . The date of the first Mexican horror film is much easier to determine. 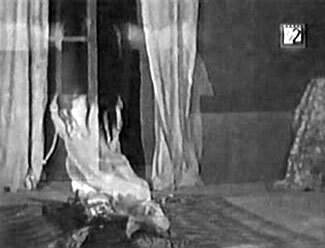 Mexican horror had its own mini-Golden Age much later on, but the very first horror movie to be produced by the Mexican film industry was La Llorona ("The Crying Woman"), made in 1933. Horror films had been shown in Mexico before this, naturally, but these had all been foreign imports. Hollywood's Universal Studios, for example, had made parallel Spanish versions of their horror films The Cat Creeps (1930) and Dracula (1931), specifically for distribution in Latin America. Now, these were not throwaway productions. Carl Laemmle, Universal's studio chief, even considered the Spanish version of The Cat Creeps — named La Voluntad del Muerto , and starring Lupita Tovar — to be superior to the English original (both films are now lost, so we'll probably never know if he was right). Modern critics tend to agree that the Spanish version of Drácula — also starring Lupita Tovar, with Carlos Villarías taking the place of Béla Lugosi — is technically superior to the Lugosi version; however, the Spanish Drácula was not particularly well-received in Mexico. It turned out that the actors Universal had hired spoke many different varieties of Spanish, a subtlety which was lost on the English- (or German-)speaking film-makers at Universal. Imagine a foreign film company hiring Andy Griffith to play Bertie Wooster, simply because both he and the character spoke English — that should give you some idea of the problem. These imports, however well-mounted or well-intentioned, were not satisfactory for a Mexican audience. From the very beginning of the history of Mexican sound cinema — yes, even from Santa , which also also starred Lupita Tovar — Mexican film-makers were dedicated to the creation of an authentic indigenous industry, one that emphasized Mexican subjects for a Mexican audience. Thus their first horror film was intended to be based not on gothic literature, as Universal's Dracula and Frankenstein had been, and not on the Old Dark House pattern (at least not completely), as The Cat Creeps had been... but rather on a specifically Mexican legend. La llorona is said to be the wandering spirit of a woman who murdered her children after her lover betrayed her by marrying another woman. Spurned by St. Peter until she could bring the souls of her children with her to the Gate of Heaven, she roams the earth, crying, "¡Ay, mis hijos, mis hijos!" Her appearance is said to be a sign of impending disaster or death. Other versions of the legend relate la llorona to the real historical figure of la Malinche, Doña Marina, the indigenous Nahua woman who became the consort of the conquistador Hernán Cortés. La Malinche occupies a deeply ambiguous role in the history of the conquest of Mexico: on the one hand, she is seen as the betrayer of her people to the European invaders; while on the other, she is credited as having helped found modern Mexico by averting unnecessary bloodshed, and pointing the way to a racially-integrated Mexico by having given birth to a mestizo son, later recognized as legitimate by the Catholic Church, whose father was Cortés himself. It's true that her son Martín was taken from her at an early age and raised by the Spanish, but this was probably done with her consent. In any case, it's certain that she did not murder her son by Cortés. Nevertheless, the folk-tale persists that la Malinche was overcome with remorse after her child was taken from her, and cursed the Spanish with whom she'd collaborated. After taking her own life, she continued to walk the earth as a miserable spirit, bringing death and misfortune wherever she went. A good deal of La Llorona -the-Movie's running time is taken up with the back-story of the Crying Woman. But rather than settle on one version of her origin or the other, the film — perhaps in a misguided burst of nationalistic zeal — gives us both. 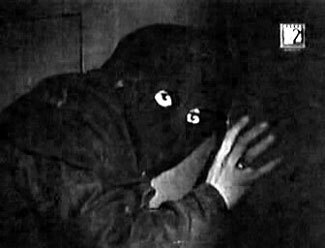 The film begins as a drunken man, stumbling home late at night, suddenly sees something off-screen that terrifies him. As we hear a terrible, ululating wail, the man falls to the ground, dead of sheer fright. "A simple heart attack," says Dr. Ricardo de Acuña, examining the body later. When his students ask him about the rumor that the dead man had seen a ghost, Dr. de Acuña laughs: things like ghosts and astral bodies are mere superstition. What importance could ghosts have to a young man of medicine, especially today of all days: the fourth birthday of his son Juanito? At Juanito's birthday party, superstition raises its head once again: the de Acuña's timid butler Mario realizes that Juan and his friends make 13 at the table, so he insists on sitting among the children. Ricardo's father-in-law, Don Fernando, upbraids him for his foolishness. Still, it should be noted that the table and chairs, as well as the birthday cake, are shaped like four-leafed clovers, so apparently some superstitions are glossed over — as long as they suggest good luck. Yet for all his lack of patience with superstition, Don Fernando is weighed down by a feeling of foreboding. In spite of his misgivings, he decides to share his suspicions with Ricardo. When Ana Maria, Ricardo's wife, was a little girl, she'd had an elder brother. On the boy's fourth birthday, all those years ago, he had mysteriously disappeared... only to turn up the next day murdered, with a knife wound in his chest. Don Fernando has had twenty-some years to reflect on that senseless crime, and rather than simply brood, he's done his research. He reveals to Ricardo that his own elder brother had died in exactly the same way, on the day of his fourth birthday — that can't be a coincidence. Don Fernando has found two books that point to a possible reason why someone would want to exact a terrible revenge on the children of his family — descendants of the original Spanish conquistadores. Ricardo settles into Don Fernando's study as the elder man begins reading from the first book. In flashback, we see a grand house in sixteenth-century Mexico: the home of Doña Ana Xicotécatl, mistress of the Spanish nobleman Don Rodrigo de Cortés. Doña Ana has had a child by Don Rodrigo, who promises to marry her and make the child his legitimate heir. In fact, Don Rodrigo is already engaged to Doña Elvira de León, a Spanish woman of rank equal to his own — clkearly a much better match than a presumptuous Indio woman, even if she is descended from Tlaxcalteca royalty. On his way from Do&nacute;a Ana's house — on "urgent business", cough cough — Don Rodrigo runs into an ambush set by a pack of robbers. He defends himself skilfully, but he's no match for the robbers' sheer numbers. Don Rodrigo is wounded; but just when it seems all is lost, another man appears on the scene and draws his sword to even the odds. One of the bandits is killed, and the others flee for their lives. 2. We're told that Don Rodrigo de Cortés is a forebear of the Moncadas, but it's also implied that Don Diego is an ancestor of Ricardo's: he's played by the same actor. Spanish-born Ramón Pereda was a popular leading man, having starred as Philo Vance in the Spanish-language version of Paramount's Benson Murder Case (1930,co-starring Carlos Villarías), and going on to portray legendary characters like Cruz Diablo, Rocambole and Arsène Lupin. Pereda played a doctor of a much different nature in the 1936 Mexican horror film El Baul Macabro .
. Don Rodrigo insists the Captain return with him to Doña Ana's house to take a glass of wine; Don Diego agrees with some hesitation. When Don Rodrigo introduces his guest to Doña Ana, the reason for his hesitation starts to become clearer. In fact, Don Diego had been on his way to see Doña Ana (though he did not know her), to declare his love for her, and to warn her of Don Rodrigo's betrayal of her honor. When Doña Ana is safely out of the room, Don Diego demands that Don Rodrigo make amends for his reprehensible behavior. Don Rodrigo immediately challenges him to a duel, though Don Diego refuses to fight a wounded man. Both men pretend nothing's wrong when Doña Ana comes back into the room. Doña Ana insists the noble stranger share that glass of wine with her lover, and Don Diego does... his eyes resting uneasily on Doña Ana's hand resting protectively over Don Rodrigo's. We dissolve to Don Rodrigo's hand clasping that of Doña Elvira, as they stand at the altar. Don Diego arrives at the church with Doña Ana and her son, but they arrive too late to stop the ceremony. The assembled crowd is horrified — not at Don Rodrigo for seducing and abandoning Doña Ana, but at Doña Ana for daring to show up at the wedding. "Get that woman out of here!" cries the priest; but Don Diego has already led the humiliated woman and her child away. Back in the present day, Ricardo interrupts Don Fernando with a chuckle. Is that all he's been worried about? That's just the popular legend of la llorona. Surely he doesn't believe such nonsense! Don Fernando is about to read from the second book when Ricardo stops him: he gets the point. He'll make sure that Juanito is closely watched, to make sure the boogeyman doesn't get him. What neither man realizes is that somebody else has been listening in to Don Fernando's story. Peering through the wall, from a mysterious hidden passage, is a sinister figure in a dark robe and a hood. Apparently little Juanito is in peril, after all, and from someone or something much more tangible than la llorona. After Ricardo dismisses Don Fernando's concerns and goes off to watch over Juanito, and after the butler and the housemaid, Nana Goya, have said goodnight, the hooded figure goes to work. A hand, wearing the same Aztec ring that we saw on Doña Ana during the flashback, reaches in through the secret panel and grabs a book off Don Fernando's shelf. Then, the panel opens wide, and the hooded figure sneaks into the room. In silhouette, we see the figure raise its arm behind Don Fernando's chair... and in its hand, we see the shadow of a familiar obsidian knife. Ricardo and Ana María, watching over Juanito, are suddenty disturbed by Don Fernando's dying groan... and then by the sound of an unearthly wailing. Ricardo runs to see what's happened, and finds his father-in-law's body. He shuts the door immediately, and tries to reassure Ana María that everything's fine. Once she's taken Juanito back to their room, Ricardo orders Nana Goya's son Francisco to go fetch the police. But while everyone's preoccupied — Ricardo with examining his father-in-law's body, Francisco running to the village, and Mario the butler cowering uncertainly in the hallway, the hooded figure takes advantage of yet another secret door to break into the bedroom. Overpowering Ana María, the intruder grabs the sleeping Juan out of the bed and runs back into the secret passage. Ricardo is just in time to dash through the door before the hidden panel can be closed. He follows the kidnapper down a flight of stairs; after a struggle, he manages to wrest his son out of the kidnapper's hands. he's wounded in his hand, though, and in the subsequent confusion, the hooded figure manages to escape. Ricardo brings Juanito back upstairs, where he finds Ana María being conforted by Nana Goya. Just then, Francisco returns with the police. Descending into the secret passage, Ricardo and the police inspector find the book the killer stole from Don Fernando's library. This, muses Ricardo, is probably the second book Don Fernando meant to read from: the book continuing the story of la llorona and her curse on the Cortés and Moncada families. La Llorona does not play fair with the identity of its killer. While it's interesting to see the Offscreen Teleportation Rule in effect as early as 1933, this does not make for a terribly satisfying viewing experience. Of course, since La Llorona is ostensibly more of a horror movie than a genuine mystery, I suppose it really doesn't need to play fair. It's a little suprising that the vengeance of the Crying Woman requires a human agent at all — though a surprise twist at the end does leave the materialistic Dr. de Acuña with something he's at a loss to explain. The movie's central concern is a plot device that would be used many times in the course of Mexican horror: the idea that the indigenous people of Mexico had not been truly subjugated by the conquista, and that they would find a way to rise up against 300 years of Spanish rule... not by armed rebellion; not be organizing politically; but by summoning the Old Gods and regaining their land by supernatural means. This is a decidely safe way of representing an idea that might well be legitimately troubling to the colonial conscience. Still, it's interesting to note that the two origin stories we're shown for la llorona present the women as tragic heroines worthy of sympathy. Both women were betrayed by the European men they trusted; both were victims before they became monsters. Then again, it's also interesting to note that in the writers' anxiousness to incorporate both origin stories for la llorona, they managed to leave out a number of key details. For instance, the Crying Woman is said to have drowned her children, as well as herself... not a method that could be copied easily by a hooded figure in a hurry. Also, note that I said children: in the legend, she walks the earth crying, "¡Ay, mis hijos!" Plural. Again, that important detail did not fit with the scenario. All in all, the makers of La Llorona tried to have it both ways far too many times to make an effective movie. Is it a mystery, or a supernatural horror flick? It's both, and it's neither: the opening promises us a ghost story, but most of the main action of the movie fails to deliver on that promise. Is it authentically Mexican, or is it just a retread of a Hollywood Old Dark House movie? 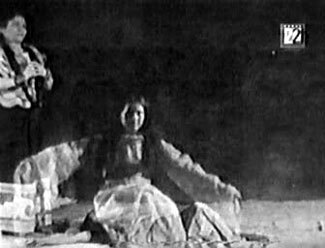 Both — and neither: the llorona episodes have been altered from their folkloric origins in order to fit the very prosaic wrapper story. Does it really embrace the new technology of sound motion pictures? Well, the second llorona flashback might as well be a silent film. Take away the narration, as Ricardo reads from the second book, and replace the sparse dialogue with intertitles, and you would do no damage to the episode at all, because it's filmed exactly as though sound had never been invented. As the very first Mexican horror film, La Llorona makes an interesting and entertaining curiosity. 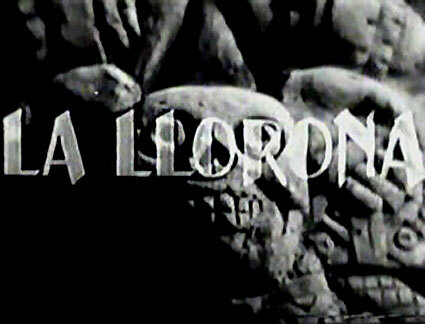 The Crying Woman would feature in msny other Mexican movies, including La Herencia de la Llorona ("The Legacy of the Crying Woman", 1947), La Llorona (directed by Rene Cardona, 1960), and Rafael Baledón's magnificent Maldición de la Llorona from 1963, in which she no longer bore even the slightest resemblance to the spirit of the legend. Then, too, there are movies like La Venganza de la Llorona (1974), starring El Santo, or any of the dozens of llorona-themed movies that have been released since the turn of the millennium. This installment is by no means either the best or the worst; it's simply the first, and deserves to be remembered as such. But we also need to remember that better things were coming for the Mexican horror film, and they were coming very, very soon.